How comforting to think about the Mediterranean Diet as we head towards the shortest and darkest day of the year! Wine, sun shine, peaches … Sounds good, right? Yes, I know Brussel sprouts don’t have quite the glamour but bear with me because the big nutritional news this week has been another study endorsing the Mediterranean Diet. We’ve written about the Diet’s correlation with reducing Alzheimers and Dementia before, but this week’s large-scale study, from the Harvard Medical School, goes a step further by linking the Mediterranean Diet to a more general reversal of ageing, in all its guises. And what’s important, according to this study, is the diet as a whole. It’s all about the combination of fruit, vegetables, nuts, legumes, fish, unrefined grains and healthy fats (olive, avocado, coconut oil) – and how these food groups work together. Any one of these, on its own, won’t help. The Mediterranean Diet, according to this new study, can directly extend lifespan because it slows the damage to chromosomes. I’m going to get a little technical now: at the end of a chromosome is a telomere, a DNA sequence that protects the chromosome, much like the plastic tip of a shoelace stops a lace fraying. Telomeres halve during the progress from infant to adult. They halve again during the onset of old age. Shortened telomeres are associated with ageing and age-related chronic disease (cancer, heart disease, diabetes etc) so, ideally, we want our telomeres to be as long and robust as possible. Our genes play a role (read our earlier post on genes and ageing here) but the rest is up to us. Obesity and sugar-sweetened drinks have already been linked to shortened telomeres, so those are two things we can tackle immediately – along with adopting a Mediterranean Diet. Incidentally, the term appears to have little to do with the Med – we spent a week in Spain at half term and barely saw a vegetable! Thinly slice the Brussel sprouts. Add any other thinly sliced green veg (I often use kale or celery but use whatever you have lying around). Dry toast the seeds and nuts until slightly darker (a couple of minutes). 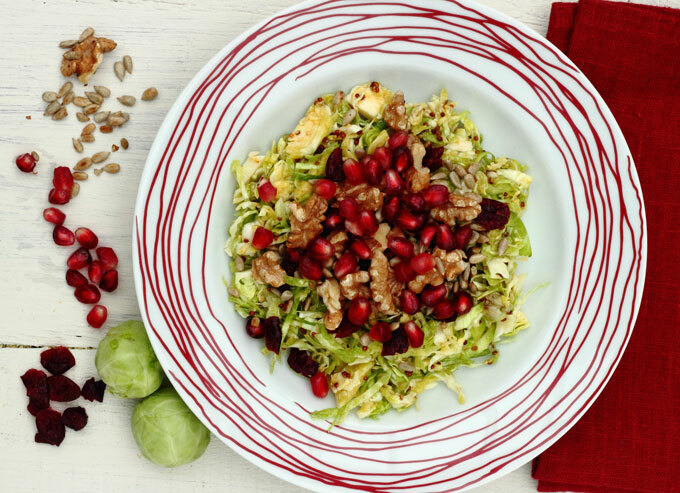 Who says Brussel sprouts can only be served soggy with turkey? Really enjoying your blog posts (since finding you through Jo at Calia web) – would love it if you could add a sharing button so its easier to share quickly to FB, Twitter etc? Thank you!!! I would like to show some thanks to the wrteir for rescuing me from this type of predicament. Right after surfing around throughout the the web and getting notions which are not helpful, I assumed my life was gone. Being alive without the solutions to the issues you have fixed by way of your good short post is a serious case, and those that would have negatively affected my career if I had not noticed your web page. Your main know-how and kindness in touching all the stuff was tremendous. I am not sure what I would have done if I hadn’t discovered such a subject like this. I am able to at this point look forward to my future. Thanks a lot so much for the skilled and effective help. I won’t think twice to endorse the website to any person who should get assistance about this topic. Thanks for your comment and glad you found us!